These days there's a new rumor or smartwatch announcement every time you fire up the internet. But they're all designed to work alongside a smartphone doing boring things like display caller IDs or rejecting a call. Not the Hoop Tracker. This is the first watch designed to keep track of your prowess at the rim so you can know for sure if your hoop dreams have any chance of coming true. And it doesn't need a smartphone assist. 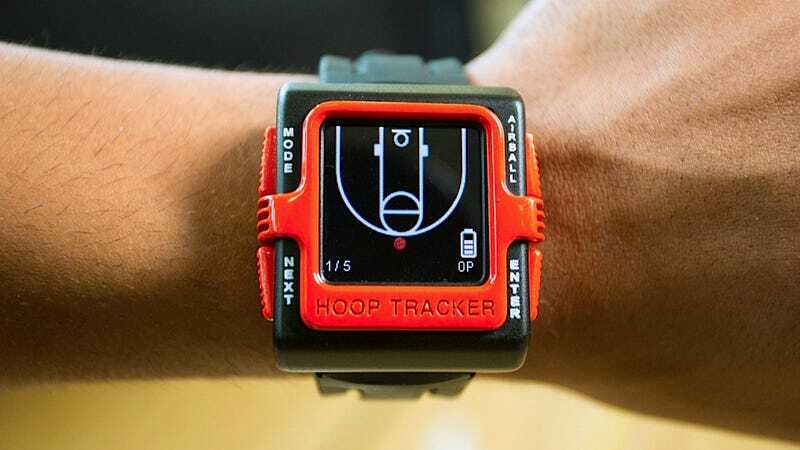 The Hoop Tracker watch is worn on your non-shooting arm, and it wirelessly connects to an included shot tracker that attaches to the rim of a basketball hoop, without affecting the game in any way. Presumably based on the distance between the watch and the rim, the Hoop Tracker system is able to determine what and where you shot—a free throw, a field goal, or a three pointer—as well as whether or not it hit the rim, the backboard, or went in. The one thing it can't track is when you airball, so a dedicated button on the watch lets you use the honor system and note your complete misses. All of your stats can be viewed directly on the Hoop Tracker watch, but the data can also be uploaded to a website which provides far more analysis and detailed views of your skills and your progress.